Plants epiphytic on a variety of larger seaweeds (usually Gelidium spp), up to 7 cm tall, axes strictly branched in one plane, about every 5-7 segments, laterals usually of limited growth. Young apices somewhat curved inward. Main axis to over 1 mm broad, the central axis up to 400 µm broad, with (in the plane of branching) up to 4 layers of cortication. Separate cortical bands indistinguishable, growing in acropetal direction. Gland cells not as numerous and not as striking as in M. exserta, still may be amply present in roughly one girdle per central cell. Tetrasporangia on side branches and on numerous proliferous branchlets present in the axils between main axis and branches, mainly on the “inside” of the moderately bent branchlets. Sporangia completely exserted, measuring ca. 50 x 45 µm, tetrahedrally divided. Spermatangia on a number of subapical segments of the side branches and adventitious branchlets, mainly covering the “inside” of the branchlets. 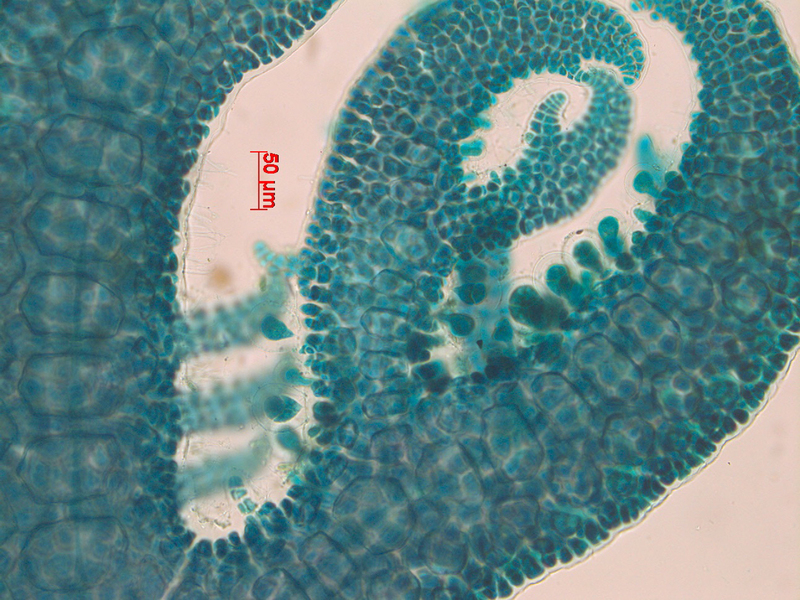 Spermatangia formed terminalyl on elongate spermatangium mother cells. Carposporophytes on subapical segments of side branches, consisting of two or three roundish gonimolobes, at maturity ca. 200 µm in diameter, the carpospores ca. 35 µm broad. Carposporophytes surrounded by ca. seven involucral filaments. Recorded from Woody Cape to the east of Transkei (31-48). The species does not seem to overlap with M. gloria-spei Stegenga, which grows on the west coast and in Namibia and attains much larger dimensions (Rull Lluch 2002). Type locality: Port St. Johns, Transkei, South Africa (Silva et al. 1996). 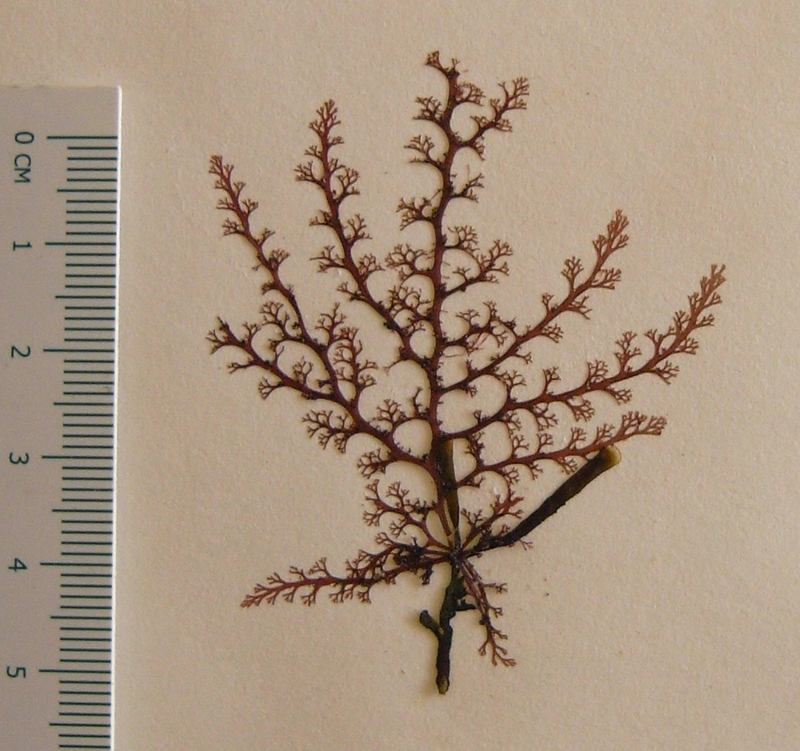 Microcladia gelidii, on Zonaria subarticulata, Morgan Bay (herbarium specimen). 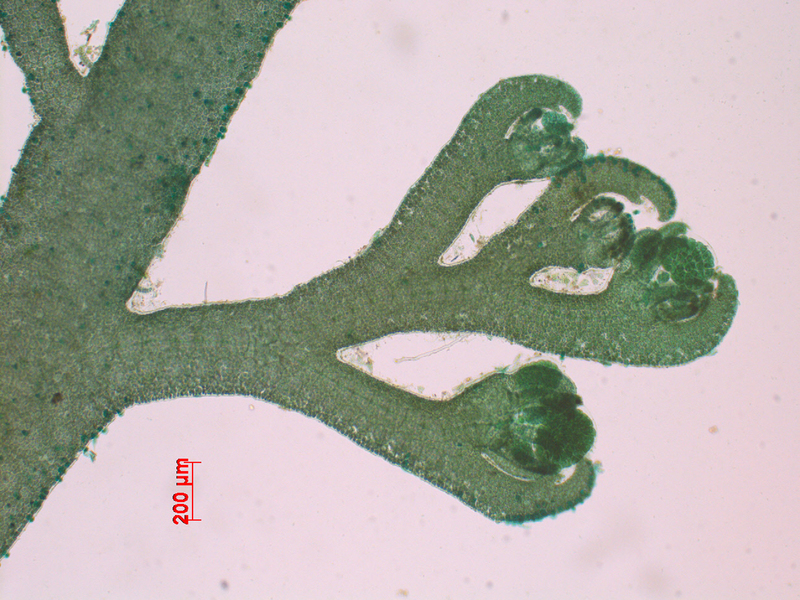 Microcladia gelidii, thallus detail with carposporophytes, Mkambathi (stained slide). Microcladia gelidii, thallus detail with tetrasporangia, note central cells (stained slide). 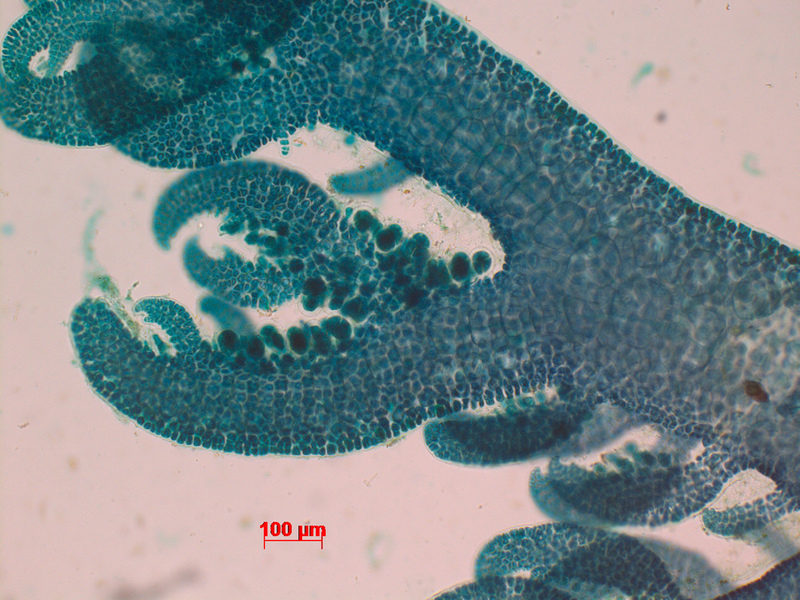 Microcladia gelidii, with tetrasporangia (stained slide). Simons, R.H. 1967. The genus Microcladia (red algae) in South Africa. Bothalia 9: 351-355, 1 fig, 2 plates.